One of my goals of this blog is to make the content constructive to Kyleigh. Right now, a lot of my thoughts are the opposite of that. That is why I have not posted anything in the past few days. I am frustrated, mad, overwhelmed and sad. I am tired of people asking me how I am and am tired of people telling me I look good. I’m not okay, even though this is my typical response. I don’t want to look good at almost 4 weeks post-op. I want to look exhausted from being up all night with a 4 week old baby. But I digress, as these comments are not constructive to the memory of my baby girl. I’m not here to complain. I’m here to honor Kyleigh. And that is what the following letter is all about … honoring my daughter. This is the letter that I wrote to Kyleigh and had read by an amazing friend at Kyleigh’s Celebration of Life. The word ‘alive’ has so many different meanings to me now. You were alive inside of me from before I even knew you were there. In the early weeks and months of your life, you made me tired and caused me to drink lots of chocolate milk, but never gave me morning sickness. You showed us your heartbeat at 9 weeks gestation. You were alive. You were alive as you grew, making my belly grow along with you. Your brother, Oliver, began to notice the changes in me and told me by belly was going to get so big that it would pop like a balloon. He told me this around the middle of my pregnancy … he had no idea just how big Mommy would get! I felt you move around 17 weeks gestation. You were alive. You were alive when you heard the loving voices of your brothers. Almost every morning, Oliver would kiss my belly and say “good morning new baby.” Often times, I would feel movement, if even the slightest, after he had told you hello. He asked me several times to let him know when I felt you kick so he could feel it too. He was excited to meet you and couldn’t wait to be a big brother again. Garrison often lifted my shirt to talk to you through my “baby button,” as he calls it. He would say “how are you today, new baby?” “love you, new baby” or ask me “new baby coming yet?” as he peered inside my belly button. He loved to go into “new baby’s room” and play with the toys that were to be yours. I found him rocking in the rocking chair one day looking at a book and I knew that he was going to be just as good of a big brother to you as Oliver has been to him. You were alive. You were alive on screen. As the pregnancy came closer and closer to the end, your Daddy and I had the unending joy of seeing you on a large flat screen T.V. through sonogram more than a half dozen times. We saw your ears, feet, arms, hands and belly. We saw all the hair on your head (yes, sonograms are so good these days that you can see hair!). I just knew when I saw all that hair that I was finally getting my dark, curly haired girl. We saw your beautiful face and your perfectly curved spine. We saw you breath, flip and kick. We saw you awake. We saw you sleeping. We saw you alive. You were alive. You were alive inside of me for nine months. I kept you safe and warm. I felt your movements, I saw your heartbeat. Part of your heart is now keeping another baby alive. You are alive. You are alive with Jesus. He caught you in his arms and took you home. You are alive in heaven and I can’t wait until the day that I can see your beautiful, dark, curly hair next to mine. You never took a breath outside of me, but nobody can say you didn’t live. You are alive, Kyleigh, you are alive! We moved just over 7 months ago. Before we moved, Oliver was wanting to get some fish. One fish, to be exact. Our neighbors had two fish and Oliver was asked to feed them a few times when they were out of town. He thought it was so cool to have that responsibility and wanted to do the same at home. He wanted one fish in a small bowl for his room. Since we were trying to sell our house, we told him that after we moved we would get him some fish. I found a small fish bowl at a garage sale and planned on filling it with 1-2 fish after the move. Plans changed. We found out we were pregnant three days after we sold our house. I spent the next month packing and preparing to move in between naps and chocolate milk cravings. It was a whirlwind month and the next several months were just as crazy. We got the essentials unpacked, but left a lot of boxes untouched, as I just didn’t have the energy to mess with it. As my pregnancy progressed, there was less and less I felt like doing. Oliver reminded us a few times about getting fish, but it was the last thing on our minds. I was preparing my mind to take care of three children and a dog. Not three children, a dog and fish that I knew would end up floating at the top of the fish bowl if I didn’t make sure they got fed. Therefore, the fish never came to be. Rodger woke up Wednesday morning with the idea that we were going to get some fish. And not just one fish in a little bowl. We surprised the boys yesterday by taking them to the pet store. We walked out with a 56 gallon fish tank. The boys got to pick out fish decor … a few brightly colored plants, a draw bridge, a rather large volcano and a cave. They got to help rinse the rock, fill the tank with water and turn on the bubbles. In a few days, we will return to the petstore to purchase the fish. I was not expecting to buy a 56 gallon tank. I also was not expecting to spend the amount of money that we did and we don’t even have fish yet. Yet, when we were done putting everything together yesterday, I felt a great sense of accomplishment and relief. We did something for the boys that they had been wanting for a long time. We did something together as a family without too many tears or two year old fits. The boys are proud of the work they did in helping set it up and I know they will take good care of their fish. We made new memories as a family. I did not expect Kyleigh to die. Who goes into the hospital to have a baby, especially when everyone involved is healthy, and think they would ever walk out empty handed? Not me. A lot of things happen in life that we do not expect. I did not expect setting up a fish tank to be such good therapy. I can’t wait to buy some fish so I can sit and watch them swim and think of my sweet Kyleigh. It has been 20 days since Kyleigh went to be with Jesus. One week since we had her celebration. People ask how we are doing. My response is that we are functioning. I do not like to use the word “normal” because our life will never be normal again. A lot of people refer to having a “new normal.” I don’t even like that phrase. We are functioning … we get up in the morning, we eat, we take care of our boys, we go to bed at night. There is still an immense feeling of sadness in our house. I don’t know when that will go away. I’m in no rush, but I know the boys, especially Oliver, pick up on that and it affects their behavior. At some point, we will move on, but life will never be normal again. Oliver asked if we could bake a cake for Kyleigh’s birthday. Absolutely! I don’t think he understands that it will be a whole year from now before we celebrate Kyleigh’s birthday, but it makes my heart happy that he thought of it and wants to celebrate her birth. Other people, like the government, do not acknowledge her birth, but that is a whole other post that I’m sure you will read about some day. Oliver and I talked about eating cake and releasing balloons again on Kyleigh’s first birthday. He was excited. It made me excited. Our baby girl has been gone for 20 days and her big brother is already planning her birthday party. That lifts some of the sadness. Mark April 5, 2013, on your calendar. We are going to have a big party! A phone call from my hair stylist to tell me she’s still praying for us. A text from my sister telling me she loves me. My day is better now. Today was the first day that we have not received a sympathy card in the mail. They have stuffed our mailbox over the past two weeks. We have received cards from loved ones, friends of friends, co-workers, neighbors, friends from high school, our parents’ friends and people we don’t even know. It is overwhelming to sit down and read them all, yet they bring us such a sense of peace. One of the cards we received last week was from one of Oliver’s teachers at school. She wrote in it that they were talking in music class about how God has a plan for each of them. Oliver spoke up and said that God had a plan for his sister but she didn’t get to stay here. On Sunday, Oliver’s preschool had “Preschool Sunday” at church. One of the songs they sang had the words “God has a plan for you and me.” Oliver had been singing it at home prior to Sunday, along with “Jesus Loves Me.” It brought tears to my eyes to listen to him sing these songs. He is four years old and fully understands both of these songs and the message they provide us. God does have a plan. We don’t know what it is. We don’t always like what it is. God did not want Kyleigh to die any more then we did. As much as we don’t like what happened, it was part of the plan. There is nothing we could have done to stop it. Some will disagree with me on this, but that is our (Rodger and I’s) theology. Some day, we will understand God’s plan. Whether that happens this side of heaven or not, we do not know. All we do know is that Kyleigh is perfect in heaven. She knows no pain. She never cried any tears. She is happy and whole. It sure wasn’t our plan, but it was God’s plan. Oliver and I talked about this after we got home from church. He understands that God’s plan was for Kyleigh to go to heaven and be with Jesus where He loves all of the us. Oliver understands that some day, he will be with his sister in heaven. He knows that right now, God’s plan is for him to be here on Earth with us. I am not a fan of Hillary Clinton. But I do agree with her … it takes a village. We are not meant to do this alone. Grammy and Pa took the boys for the night last night and it was refreshing to have some time with just Rodger and I. We spent the evening talking with a dear friend, one who knows when to just listen and knows when to support us with words. It was nice to sleep in this morning and talk on the phone with another wonderful friend as Rodger fixed me breakfast. She called to see how we are all doing and always knows just the right words to say. Never pushy or in your face, just there when you need her. After a quiet morning, the boys came home and we all went to the Kite Festival. Two friends, along with their children, went with us. They sat and watched the kites with us in silence. They took the boys to walk around and do the kid activities. They talked about Kyleigh. They were there to love and comfort our children when honestly, we couldn’t. This evening, friends who live 40+ minutes away dropped off dinner. The boys played outside with neighbor friends who ended up sharing our meal with us. Again, people were there to talk, listen and love on us. At least two other people offered to help us today. We had to turn them down because we already knew we had the help. They understood and didn’t take offense to being told no. Our day was filled with people who love us and love our boys. Whether it was a phone call or their presence, they supported us and let us know that they were there for us. Some dropped everything to just sit with us, while others gave up their time to be there for the boys. It takes a village. Not just to raise children, but to make it through life. I know those that were there for us these past two days are going to be there for us for life. I don’t have to name names, they know who they are. And they know that we love and appreciate all that they do for our family. It has been two weeks and one day since Kyleigh left this world for a better place. As I sit here, struggling to stay awake, all I can think of is how I can honor my daughter. What do I do, what do I say, to make her matter? She matters to me and my family. There is no doubt about that. How do I get her to matter to others? I share her story. 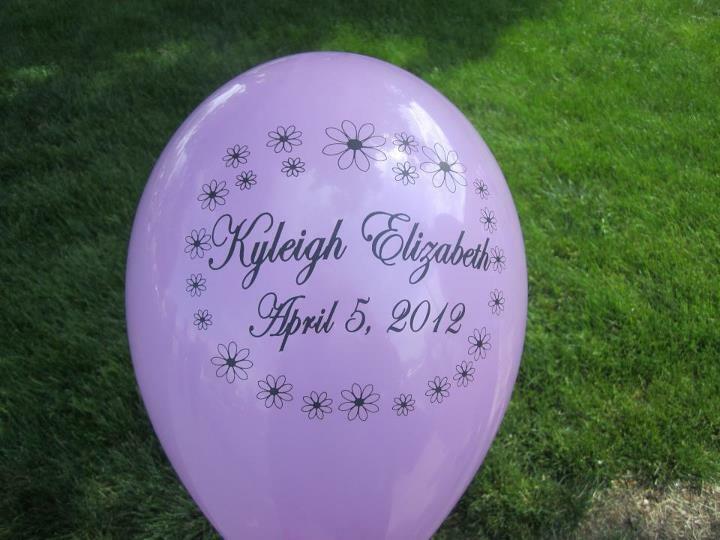 I share the stories of others; those whose lives have been touched by Kyleigh, if even for a brief moment. Those stories will come out in the coming days, weeks, months and even years. If you have a story to share about Kyleigh, send it to me. If something about her has touched your heart, or the heart of someone you know, tell me. Let her story be heard.